Last night, voters in Mississippi made history. By re-nominating Senator Thad Cochran to a seventh term, in the manner and with the voters that they did it, Mississippians who voted in the Republican primary gave their Senator an entirely new coalition as well as the chance for a new term. In the article linked below, the Washington Post’s Chris Cilizza expresses amazement that Cochran was able to bring to his side at lest 10,000 Back voters. Amazing it was; but Cilizza doesn’t mention the bigger point : Cochran now becomes the only GOP senator in the entire nation ti owe his GOP nomination significantly to Black voters. this is as big a deal as it gets. For almost 50 years now, and increasingly, the GOP has gotten along without important Black support. T>he party that was of Abe Lincoln, that was the home of civil rights and Black advancement — and remained significantly that right into the Richard Nixon years — has become the party almost entirely of Caucasian voters. Almost no Blacks shape its policies, its platform, its language. Almost no Black voters vote for its candidates. and thus the GOP of the last 50 years has behaved like a man with only one arm, or one leg ; doing only half the job a major political party is supposed to do; and this at a time when the other major political party, the Democrats, became the party of pretty nearly everybody. The GOP of the last 50 years had no choice but to act by half only. As black voters left it, what remained to the GOP was what the party had to lead. A party has no choice but to begin by voicing what its core voters want. That’s how the ;party’s nominees for office are chosen. Voters who don’t participate in the choosing do nor enter that conversation. It was that GOP, the GOP laid waste to by Thad Cochran’s victory, in which the Tuesday loser, Chris McDaniel, represented so negatively. He deserved to lose: and with the giant effort made by Cochran’s team, he did lose. ^ gone for now and probably for a long time ; the politics of White voters only. In Mississippi now, all of that has changed. 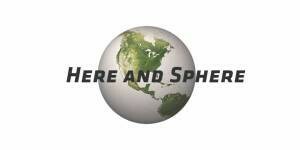 How big was Black participation in yesterday;s win by Cochran over his tea Party challenger ? As Cilizza notes, voting in the 24 Mississippi counties whose vote is 50 percent Black or more rose by a full 4o percent; where in the state’;s other counties it rose only by 16 percent. 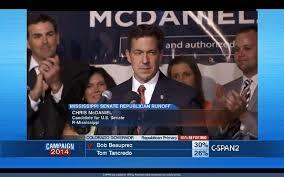 The extra 7500 votes picked up by Cochran from Black Mississippians more than equalled his margin of victory. Nearly all the Black Mississippians who assured Cochran’s victory are Democrats and will likely remain so. But for Cochran, they now have a stake in his success, and he in their participation. Big results are likely to follow. First, Cochran is likely now to become the first GOP Senator to vote for a new Voting rights act. Second, Cochran is likely to pursue the education funding, job training programs, and housing support that his Black core of supporters want. third, other GOP candidates in Mississippi are likely now to seek out the votes of those who gave Cochran his nomination : if only because if they don’t, their GOP opponents will. Even bigger consequences may well follow. Black voters in other deeply red states may decide that they, too, need participate in a GOP primary in the states that allow open primary voting). After all, what to do ? Be let out entirely of the decision, or become the big decider ? And thus the national GOP faces huge change : because no group has a greater ability to impact a GOP nomination than Black voters, almost entirely out of the party’s loop for so long. It was always going to be in the South — the deep South especially — that this revolution had to occur if at all. The GOP has become such a party of the South that whatever changes it there changes its direction generally; and Black voters of the deep South have the greatest numbers to bear upon the GOP. 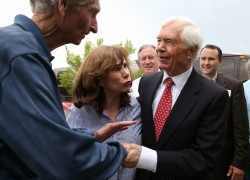 Cochran’s victory may not be replicated in other states; nothing is inevitable in politics. But the potential is there. the GOP stands at the edge of a huge revolution, which, if it happens, will utterly change — and all for the better — the entire nation’s policy future. Mike – it seems highly likely that the black voters who voted for Cochran yesterday will vote for his (rather conservative, anti-abortion, anti-Affordable Care Act) Democratic opponent in November, but that Cochran will nonetheless win. Any Democrat who voted for Cochran presumably solely for the purpose of preventing McDaniel from waltzing into the Senate in November. I see no reason to think that Cochran, who is counted as a moderate only in relation to someone like McDaniel, should be expected to vote for a new Voting Rights Act or any other initiative that his Party opposes. Maybe he will, but most likely only if he already knows that his vote won’t tip the balance against McConnell and, heaven forbid, in favor of Obama. We shall see, but if you ever uncover an instance of Cochran having a decisive influence that bucks Republican orthodoxy, please do let me know.